The typical motherly question of “what did you learn in school today” now has a new meaning for many coeds at Rutgers University. 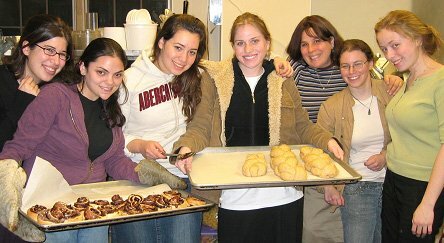 Besides learning liberal arts and sciences, college women who attend the Chabad House at Rutgers University acquire a hands-on, age-old talent for baking Challah bread for the Shabbat. Through a radically new approach to Jewish education, the Chabad House at Rutgers offers young men and women on the college campus unique Jewish experience workshops in Building a Jewish Home and Family, Running a Jewish Organization, Publishing a Jewish Newspaper, Marketing and Advertising in the Jewish Community, Jewish Chaplaincy in Hospitals, Nursing Homes, Juvenile Prisons, and Children’s Rehabilitation Centers, as well as fun culinary activities such as Hamantaschen baking for Purim, and Matzah baking for Passover. Rebbetzin Sarah also gives a weekly tour of the new, state-of-the-art, 5-star spa-grade Chabad Mikvah to give students a glimpse into the beauty of the mitzvah of family purity.